The operator of the pick-up truck was cited by the police for running a red light. Our client, on the motorcycle, went through the intersection on a green light. The driver of the pick-up was extremely remorseful for his involvement in the accident and told our office that a malfunctioning railroad crossing caused a dangerous disruption of the intersection traffic control signals. The railroad company persistently denied the existence of malfunctions. A lawsuit provided the opportunity to obtain sworn testimony from witnesses, ranging from store owners, school district administrators, school bus drivers and area residents, all who consistently stated that the railroad crossing had malfunctioned (falsely activated causing the crossing arms to go down or up and down without a train on the track) over many years. The railroad crossing malfunctions were the subject of a local news report and the railroad company settled the claim with our client just short of trial. A daughter sought representation after her father was fatally injured in a head on collision in a rural area of Texas. The police investigation blamed the accident on her father for driving on the wrong side of the highway. The daughter insisted that the facts in the case did not add up and an investigation by our office revealed the daughter's suspicions were correct. Ultimately, the police report was changed to reflect fault on the other driver and the insurance carrier for the "real" at-fault driver settled the claim with our client. A family sought recourse for an automobile/truck accident that injured a Clear Lake father and husband who was on his way home from work and had no recollection of the accident due to head trauma. The police investigation blamed the accident on our client for running into the back of a stalled truck. The lawsuit revealed that the truck driver drove his truck down a highway knowing it had serious maintenance problems, upon the direction of the company dispatcher, ultimately breaking down, spilling oil and debris on the roadway. The evidence obtained in the litigation revealed the oil and debris on the roadway was the probable cause of the accident. The facts of this case were the subject of a local television story discussing the hazards of road debris on Texas roadways. The trucking company settled the claim with our client prior to trial. A young mother was on her way home from work and was involved in a horrific automobile accident that caused immediate fatal injury. Investigation revealed that another driver was responsible for causing the accident for running a stop sign. The settlement provided funds for the mother's surviving child through a trust for the use and benefit of her child, and the victim's parents also received settlement funds to resolve the litigation. A teenager was injured in an intersection collision when another driver ran a red light. The teenager complained primarily of neck pain and the pain, symptoms and medical treatment continued for about two years. Without fractures, blood and guts in many cases insurance carriers have taken the position, without justification, that you're not injured. As such, insurance carriers are forcing many legitimate claims into litigation that should settle. A jury awarded our client damages in excess of the negligent driver's insurance coverage. The insurance carrier had not made an offer prior to trial, despite our client's repeated efforts to settle the claim within the policy limits prior to trial. A Texas hunter was catastrophically injured when he drove into the side of a 48' trailer attached as part of an 18 wheeler tractor trailer rig. The accident happened on a dark, rural Texas highway late at night when the 18 wheeler operator pulled from a stop sign onto the highway. The police investigation found fault on our client for hitting the 48' trailer that was blocking his lane of traffic. The resulting collision and injury was horrible and due to the severity of injury our client had no recollection of the accident. After investigating the accident scene, talking to witnesses and looking at the damage done to the vehicles we filed a lawsuit on behalf of our client. Our investigation revealed: 1) the driver of the 18-wheeler rig was an inexperienced driver and had a documented history of difficulty of starting from a stopped position; 2) the tractor trailer operator was illegally operating his truck on a road marked "No Thru Trucks" when he entered the highway; 3) the tractor trailer operator failed to submit a driver's log, failed to keep an employee file and failed to submit to a drug/alcohol test following this accident; 4) the tractor trailer operator was attempting to illegally park his rig on the side of the highway when this accident occurred, contributing to the slow movement in blocking the main lanes of traffic on the Texas highway; 5) the evidence proved that the 48' trailer was totally blocking our client's lane of traffic as he approached at night at highway speed; 6) that underride and undercarriage accidents have been extensively studied and these studies prove that nighttime crashes result because of the extreme difficulty in distinguishing a trailer blocking a lane of traffic at night time to avoid the collision. Studies have shown that slow moving trucks create little contrast at night; that a driver's might perceive truck markings as roadside markings or distant taillights; that a trailer at night will not be conspicuous and that by the time a driver's headlights illuminate the trailer there is not adequate time to stop; and, that an unloaded flatbed trailer is virtually invisible blocking a lane of traffic at night. After identifying the facts of this collision and presenting these facts to the insurance company for the truck driver, the trucking company settled with our client. A Texas lumber mill worker was on his way home from work when he was horribly injured when he drove his pick-up truck into the side of an 18 wheeler trailer that was blocking his lane of traffic on a dark Texas rural highway. The driver of the 18 wheeler was on the job and had missed his turn. Instead of driving to a safe location to turn around, the truck driver tried to back his trailer down a side gravel path along a Texas Farm Road. While attempting this dangerous maneuver, his trailer was blocking our client's lane of traffic as he approached. As a result of the documented difficulty in recognizing and reacting to an 18 wheeler trailer blocking the lane of traffic at night, a horrific collision occurred when our client's truck had an underride collision with the trailer. The trucking company settled with our client after presentation of the injury and liability factors to their insurance carrier. A retired Texas man was involved in a severe motor vehicle accident when a trailer broke away from another vehicle and struck his car. Our investigation revealed that the operator of the towing vehicle failed to properly secure the trailer which allowed it to break free. The insurance carrier for the trailer settled with our client during litigation. A welder was working for a contractor in an industrial facility and a violent explosion tossed the welder through the air and caused a closed head injury. Immediate investigation of the accident by our office along with an industry consultant revealed the force of the blast. Fault and cause of the welder's injury were in dispute in the litigation. The industrial facility settled with the injured welder during the litigation. A month-old child tragically had her father killed in an explosion in an industrial accident. The little girl's father had been inside a vessel when an explosion occurred. Litigation followed against several Defendants and continued for over a year with many depositions obtained from witnesses. The case settled short of trial with trust funds being established to care for the little girl for the remainder of her life. A mall patron was exiting a store and stepped on a broken curb next to the main drive and fell and sustained a serious fracture requiring major surgery and a lengthy rehabilitation. Our investigation revealed the curb was in disrepair and that the mall had painted over the broken curb instead of repairing the curb. The paint over made the defect in the curb difficult to see, especially since most people are focusing on not getting run over by traffic when they are about to enter the a traffic lane. 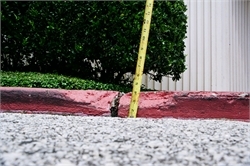 The deficiencies in the curb were in violation of municipal codes and industry standards. The mall settled with our client during litigation. An EMS worker required major back surgery when he fell on a wet hallway at his office building. Investigation in the lawsuit revealed that a tenant in the building negotiated a deal with the landlord to mop the floors at night. The tenant delegated this job to a person with no experience in building maintenance. A jury returned a verdict in favor of the EMS worker. A 26-year old widow with an infant child sought representation after the shooting death of her husband at a convenience store. Investigation revealed the store had an extensive history of criminal activity and failed to take adequate measures to safeguard its employees. The store settled the claim with our client. A vendor employee was in a grocery store and a grocery store employee ran into her hand with a motor-operated pallet jack, crushing her finger. Lawsuit investigation revealed that the employee operating the pallet jack was in violation of company policy in operation of the equipment. A jury returned a verdict in favor of our client. A grocery store patron was exiting a grocery store and the front wheel of the grocery cart fell in a parking lot pothole, which was hard to distinguish from the rest of the lot because it was filled with water, and the cart flipped over causing the shopper to fall and suffer injury. Litigation investigation revealed that the owner of the shopping center had many prior complaints for months from their tenants regarding the potholes in the parking lot. The owner of the shopping center settled with our client and they also re-paved the entire lot to the benefit of all of their tenants and future customers. A grandmother was shopping at a supermarket and fell in the entry of the store on a mat that had bunched up, causing a trip hazard. A Court ordered the store to produce its accident files which revealed many similar accidents involving the grocery store chain. Our office produced reports prepared by industry experts showing how the problem could be reduced if not entirely eliminated. The store settled with our client during litigation. Our office has now handled a number of similar cases where falls have occurred as a result of misused floor mats. Typically, the mats are of poor quality, not secured to the floor, and tend to bunch up or flip over and cause trip hazards. A warehouse store shopper suffered deep and life threatening laceration as a result of falling merchandise. Our client was shopping at the store when a razor sharp piece of flashing fell from the shelf and hit his arm. A quick thinking customer applied pressure and a tourniquet to his arm to prevent a fatal loss of blood. Investigation revealed that this store had many prior events of flashing falling and even had events of flashing falling off the shelves and causing almost identical injury with significant lacerations. Falling merchandise events are well documented and have caused many injuries and deaths. In this particular store, one side of the flashing isle had the flashing properly secured to prevent falling merchandise, but the other side of the isle, where our client was injured, did not have the flashing secured. The flashing was overstocked and stacked all the way to the lip of the shelf, was not adequately secured and fell causing near fatal injury. The warehouse store settled with our client when presented with these facts. An automobile dealer customer sustained a severe laceration which required urgent surgery as a result of the auto dealer using razor wire at ground level in a pedestrian area of the dealership lot. The customer was walking across a pedestrian area of the lot at night to look at a truck he was interested in when his leg got entangled in the razor wire causing a horrible, deep laceration. The razor wire was difficult to see during the day because of shadows and impossible to see at night. it was on the ground directly in the path of customers and employees attached to a fence. Razor wire is a more dangerous form of barbed wire and is designed to maim. Razor wire barbs have piercing and gripping action and the use of razor wire is usually associated with correctional institutions, prisoner of war camps and war zones. Many municipalities have either outlawed the use of razor wire or have ordinances regulating its use. All manufacturer documentation found regarding the use of razor wire specifies a "minimum height of eight feet" and that razor wire must avoid "any and all pedestrian traffic". The automobile dealer settled with our client after being presented with these facts. A family brought a claim for the tragic loss of their son as a result of a choking death caused by a food product manufactured in Taiwan. Upon investigation by our office, it was discovered that the product had been responsible for the deaths of children in Taiwan, Japan, Canada and the United States. The Japanese government and the Taiwanese government had previously investigated the series of deaths associated with the product and had been highly critical of the design and warning associated with the product. The product was imported to the United States following the string of deaths in Japan and Taiwan and ultimately took the life of a Texas child. Litigation was filed. News media published an investigative stories that brought the series of events to the public eye. The retailer that sold the product discontinued selling the product and the United Stated Food and Drug Administration banned the product from import into the United States. The Defendants settled the claim with the child's family. A Texas hospital nurse sought representation after a horrible injury she suffered on the job when a wheelchair suddenly snapped shut and caught her hand in a pinch point. Our investigation revealed that the same hospital, which had recently acquired the wheelchairs, had multiple similar events in a very short period of time. The hospital pulled these wheelchairs out of service. 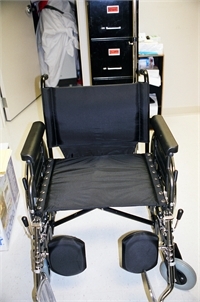 Further investigation revealed many similar incidents with this model of wheelchair in medical facilities across the country. The manufacturer settled this products liability claim with our client when presented with the pattern of injury caused by the sudden closure of the wheelchair seat which led to a series of horrific injuries. A Texas restaurant employee was working at her job and was in the process of checking in a vendor when the vendor allowed a bread cart to fall off the lift of the vendor's truck. The bread cart fell on our client and caused a severe leg fracture. Litigation investigation revealed the vendor, in operation of his lift and truck, violated instructions that were written on the side of the truck. The vendor settled with our client during litigation. A Texas homeowner, while cleaning his patio roof, fell when a support broke and he severely fractured his arm. A builder's consultant hired by our office determined that support brackets were not installed which caused the roof to give way. The contractor who installed the patio roof settled the litigation with our client. Our office has handled many claims where our clients have been the victims of drivers who have operated their vehicle under the influence of drugs or alcohol. If this happens to you or your family, it is more than an accident....it is a crime. Our office will aggressively pursue all claims against intoxicated drivers. Many victims are not aware of their full legal rights when they are a victim of an intoxicated driver. Our office will endeavor to obtain the full range of damages, including exemplary and punitive damages, in all cases where our clients have been victimized by drunk drivers. A Texas college student sustained a serious arm burn injury when a gel candle suddenly flared up like a torch. Our investigation revealed that the candle was manufactured as a side product of a salon with little experience in making the candles. The improper mix of the candle ingredients led to the flare up and injury sustained by our client. The case was settled by the manufacturer of the candle during litigation. Our office has handled many uninsured motorist and underinsured motorist claims. Uninsured claims involve accidents where the at fault driver does not carry liability insurance. Underinsured motorist claims involved accidents where the at fault driver does not have enough liability insurance coverage to pay the full value of your claim. In the event you are involved with an accident with an uninsured or underinsured motorist, we will make every effort to make a recovery that fully compensates you for your injury. Our office has handled multiple cases where our clients have been injured as a result of a dog bite. The wounds from a dog bite can be extreme and leave serious disfigurement. Dog bite cases in Texas may be pursued if the dog owner knew or should have known the animal had prior vicious episodes or if the owner of the animal was negligent in handling the animal. Many dog bite incidents are not as a result of a vicious pet but in the manner the pet was handled by the owner. The failure to properly restrain on enclose a pet may be negligence and lead to liability against the owner of the pet. The owner's placing of the pet in an environment that may cause the dog to bite may lead to liability against the owner. We have handled dog bite cases where the dog had prior vicious incidents, where the owner failed to properly restrain the pet, where the owner failed to comply with leash laws and where the owner put the dog in an environment where the dog's dangerous behavior was predictable. Dogs are not the only animal capable of inflicting serious injury. If an owner of any animal puts the animal in an environment that is likely to cause a bad result, there may be liability established against the owner of the animal. Our office handled a case where our client suffered very severe injury as a result of a runaway horse in a parade environment. There was in all likelihood nothing wrong with the horse, other than the environment it was dealing with. The horse was frightened by the environment, had not been properly orientated to the environment and was not properly handled. This led to a near fatal incident to a bystander. Any serious injury caused by an animal merits investigation to determine the underlying cause. Homeowner's insurance may be available in many cases to pay damages in claims arising out of injuries caused by dogs or other animals. Our office has handled and taken to trial family law related cases. Our effort in family law cases is to bring resolution and closure to our client in the least contentious manner. Divorce cases with children bear keeping in mind at all times "the best interest of the child." Mediation is ordered in nearly all family law cases where the parties fail to reach an agreement. The Court is always concerned with the best interest of the children in divorce or modification cases. Our consistent advice to our clients is to "be reasonable, be courteous and don't be the source of unnecessary grief". There are unfortunately cases where our client's spouse or ex-spouse isn't behaving in an appropriate fashion. We don't want that to be our client. We have litigated cases involving property disputes, conservatorship disputes, primary custodian disputes, child support disputes and modification involving possession, custody, primary residence and possession of the child. If your divorce case involves limited property issues and no children, or the parties agree on the issues involving the children, our office will consider a reasonable flat fee on your cases after an initial consultation. There is no fee for the initial consultation. A Texas college student was on a boating outing that turned horribly wrong as a result of a young, inexperienced boater who was operating the boat. The boat operator's inexperience and lack of safety knowledge regarding the use of the boats equipment led to a serious hand injury to our client requiring surgery. The insurance carrier for the boat owner settled the claim with our client. *These case summaries are a small sampling of the cases handled by our office. Each case is different, and similar results may not be obtained in your case. Past performance is no guarantee of future results. Bill Wells has vast experience in Texas Courtrooms in cases involving injuries and deaths as a result of negligence. "Tort Reform" is a very misunderstood concept that has made recoveries in personal injury cases very challenging in Texas. Bill Wells meets the challenge head on in his representation of clients harmed by wrongdoers. 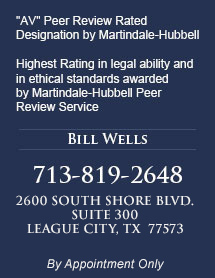 Mr. Wells' personal injury experience has resulted in his award of "Board Certification" in the field of personal injury by the Texas Board of Legal Specialization. Personal injury cases are complex and complicated. There are medical lien issues from both private insurance carriers and from medical providers such as Medicare and Medicaid, there are liability and negligence issues and there are damage issues. The adverse insurance carrier will use every tool in their toolbox to deny or limit your claim, including blaming you for an accident that there is no rational substance behind false allegations against you. Mr. Wells will use his thirty three years of litigation experience to fight for your rights if you have been injured or a family member killed as a result of a wrongdoer's negligence. The cases summarized are a small sampling of the cases handled by Bill Wells. Each case is different, and similar results may not be obtained in your case. Past performance is no guarantee of future results.